It has been three years since we adopted our sweet mischief man in China. On October 29th, 2007, we entered the JiangXi Civil Affairs Office and were shocked to find a very fragile, weak and quite delayed little guy waiting for us. He was so afraid and we were very afraid as well. Somehow and someway, day by day, we were able to help our little guy get healthy and strong. We were able to give him the tools to transform into the amazing little boy who has completed our family. As much as we gave to Ethan, he gave us so much more. He gave us a stronger will, courage to face the unknown and the gift of watching one of the strongest and most resilient children that we have every known. He has beaten the odds and he continues to surprise us daily with every new milestone reached. There are still remnants of the damage that was done to his psyche through his neglect in China but we can see that he feels very loved and mostly secure that we will always be there for him...always and forever. We pray that someday it all falls away but even if it does not, we do know that his future is very bright! 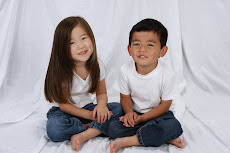 Happy 3 years Ethan Frederick Zhiqing! We love you with every fiber of our being; just as we do your sister and brother. Tonight I was reading to the Dynamic Duo before bed. The book that I was reading to them was one that Katie could definitely help me with since her reading is really coming along. I asked her to read a couple of sentences and she strained to see the page. She put her face all the way up to the page so that she could see and she was struggling big time! I asked her whether she could see and she became defensive and she said that she could see it. She definitely could not see it without being on top of it. I had to try my level best not to cry....I saved my tears until after she went to bed. I then had a big time boo hoo session. I needed it. As I was brushing her teeth I told her that sometimes when people have a hard time seeing words on a page that they could learn an alphabet that they can feel with their fingers and they can read books that way. She asked me what it was called and I told her it was called braille. I asked her if she would like to learn braille and she told me that she would...it sounded cool. I better take note of my daughter's positive outlook pretty quickly because all I could think at that time was that we were teaching her how to read the written word but that she may not be able to do so for very long. I pray that this Friday when I take her to see the specialist down at Bascolm Palmer Eye Institute, that they are able to prescribe new lenses that will give her a greater field of vision for now and that they can do so for a long time. I know that there are worse things and that it will someday be our new normal but I hate this. I hate it more than I can ever express. I have had so many friends reach out to help fund raise in addition to other kind offers. Thank you to each and every one of you. Right now there are two opportunities to help by purchasing items. Heather has decided to auction many gently used (with love) items that were both handmade and store bought to benefit the Foundation Fighting Blindness. What a beautiful effort and we are so very grateful. The auction ends October 12th and you can check it out here. Thank you Heather! The other shopping opportunity is made possible by my dear friend Minouche. Minouche is also a friend that was made through the adoption world. We are a part of the same FCC group and we have grown to be close and trusted friends. She is such a supportive person and so it came as no surprise to me when she decided to donate 10% of the proceeds of some of her clothing line from her Online Etsy Shop, Yaya Kids Couture to the Foundation Fighting Blindness. Yaya is the pet name of her beautiful daughter, who our family loves very much. 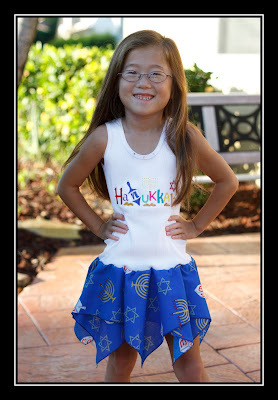 She has a back to school clothing line as well as a Hanukkah line. Here is her Facebook Page, where you can purchase the clothing on sale this week. If you are not on facebook, then just email her though her Etsy site and she will give you the promotional price and will make the donation to the foundation. Thank you Minouche! The friends that I have made through the adoption world, both in person and online are very treasured. They have proven their friendship time and again. I know that they are all in this with us for the long haul.....until a cure is found. That is how we are approaching how we communicate to Katie about her eye condition. I have consulted with a therapist that specializes in children and she has proved to be a valuable resource for us. Slow and steady will win the race. It will be much like the adoption conversation; give bits of info and wait for further questioning. Only give her what she asks for and above all, do not answer any questions that we are not able to answer pretty quickly. Our answer to questions like those should be, "I really want to think about what you have asked me before I answer you...Let me go ahead and do that and then we will talk about it further. I promise I will give you the answer soon." Of course, we will answer the question as quickly as possible and when we are fully prepared to do so. Our fear is that someone will spill the beans to her in a totally inappropriate way but the counselor make me realize that the odds of this are quite small considering she is very young and she is supervised by us most of the time outside of school. There is no real reason to give her the whole story now and terrify her unnecessarily. She is only 5 years old and is too young to be able to process this information properly. If this was going to happen overnight, then yes, we would need to prepare her immediately. As far as we know, Katie's eyesight will wane away slowly, giving us a great deal of time to prepare her. The first bit of communication will be about the Vision Walk that we are participating in on 10/23. There will be a team of people and she will want to know why they are all there and of course since we are "The Katie Starr Team," it will quite obviously be about her. With the therapist's direction, we have decided to tell her the truth in a dose that she can digest. We will tell her that we are walking and collecting money to aid researchers to help people like her that have weak eyesight. We are hoping that the research scientists can find a cure so that her eyes and many other peoples eyes can be stronger. She knows that he eyes are weak so that is perfect. In one of our sessions the therapist met Katie and was quite taken with her intelligence and openness. After interacting with her she assured me that if handled properly, Katie Starr will be able to cope with it and thrive despite it. I believe in my heart that she is right. Another good piece of advice that she gave me was to try to enhance her other senses so that she can compensate as her sight weakens. Also to draw Ethan into it as well so that she does not feel singled out and of course him feel left out. We need to ask them to give us feedback on taste, smells, sounds etc. in order that they are challenging those senses. We will train them to more fully experience what is presented to us...not just "see" with our eyes. We can "see" with our ears, nose, mouth and touch. She has given me several exercises to do in order to accomplish this. I feel that we are taking positive steps. Our next step is to meet with another specialist in a couple of weeks to get a better idea about timelines and things we can do in the interim to help her preserve her sight as long as possible. Baby steps are doable. It was that slow old tortoise that won the race against the speedy hare. Taking it slowly will help us to prevail in the end as well.